IT’S A staggering 53 years since the most successful folk/rock duo of all time recorded their first No 1 hit single The Sound of Silence. 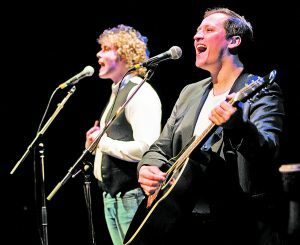 But while the real Paul Simon and Art Garfunkel no longer tour, the tribute show The Simon and Garfunkel Story has performed in more than 50 countries across the world, from Sydney to Seattle. Following a run at the Lyric Theatre in London’s Shaftsbury Avenue, the show with its cast of West End actor-musicians is heading to Woking’s New Victoria Theatre on Friday 28 September. It will take the audience from the pair’s humble beginnings as rock ‘n’ roll duo Tom and Jerry, through their massive success and dramatic break-up before finishing with a recreation of the 1981 Central Park re-formation concert. Using a huge projection screen, the show features 1960s photos and film footage while a full live band perform all their hits including Mrs Robinson, Cecilia, Bridge Over Troubled Water, Homeward Bound, Sound of Silence and more.